These groups meet for Bible study, using study materials which usually follow the Sunday sermon series. There is also time for prayer. Anyone and everyone is welcome to come along. 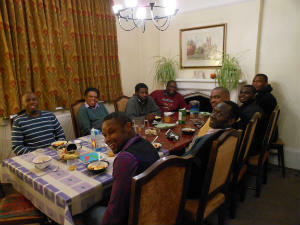 Monthly Meat for Men meets on the last Friday of the month, 8.00 - 9.30 pm, at the Rectory. Meat for the stomach, meat for the soul. We begin with a shared meal, and then discuss a topic of Christian discipleship. Open to all men at St Barnabas. Christianity Explored is a 6 week (or 10 week) course designed to help people explore the Christian faith. Each week there is a (DVD) talk, a small group discussion, and a 'guided tour' of Mark's Gospel. Very suitable for anyone who has lots of honest questions, doesn't know quite what to believe, but would like to find out more. The next course will start in September 2019 on Tuesday evenings.